End of the day, factory whistle cries, Men walk through these gates with death in their eyes. Bring us the living dead. People no one will miss. TEPCO’s involvement with anti-social forces and their inability to filter them out of the work-place is a national security issue … Nuclear energy shouldn’t be in the hands of the yakuza. They’re gamblers and an intelligent person doesn’t want them to have atomic dice to play with. – Japanese Senator1…. The exploitation of labor at nuclear plants depends on the tools of social engineering, of government, mass media and schools. This is the hidden and shameful side of today’s materialist society and belies our complicity in a criminalized culture. Inefficient and corrupt employment practices at the Fukushima Nuclear Power Plant (FNPP) are prolonging the disaster. Tokyo Electric Power Company (Tepco) outsources 90 percent of the work to subcontractors, mainly utilizing Japan’s criminal syndicates, “the Yakuza.” Japan is still a middle class society and most people will not volunteer for nuclear work. Japan risks running out of workers who have not exceeded their legal radiation limits. According to a 2011 report from the Union of Concerned Scientists, water withdrawals vary widely from one type of power plant to another: “On average in 2008, plants in the US nuclear fleet withdrew nearly eight times more freshwater than natural gas plants per unit of electricity generated, and 11 percent more than coal plants. When water efficiency is factored into the equation, alternative energy sources, like wind turbines and solar cells, compare more favorably to coal, gas, and nuclear power. Treading water, BULLETIN OF THE ATOMIC SCIENTISTS, BY DAWN STOVER | 22 AUGUST 2012 In 1954, Lewis Strauss, then chairman of the Atomic Energy Commission, gave a speech in which he famously predicted that “our children will enjoy in their homes electrical energy too cheap to meter.” Whether he was talking about fission reactors or a secret fusion project is unclear, but he was wrong in either case. What did turn out to be too cheap to meter, however, was water. Unless you have a private well or spring on your property, you probably don’t enjoy free water in your home. But it’s a different story if you’re running a power plant or drilling for oil: The biggest water consumers pay the least for every gallon, and most power plants pay almost nothing at all. Perhaps that’s why so little research and funding is devoted to saving water — far less than is spent on energy efficiency. On and off over the past half century, scientists have been researching ways to extract uranium from seawater, but the process has always proved so costly and laborious that no one in the industry took it seriously. The US Department of Energy recently funded a project to develop a more cost-efficient process, and as a result researchers were able to decrease the cost estimate for ocean-mined uranium by over 46 percent to $300 per pound. Unfortunately, that’s five times costlier than traditional mining and a far cry from economical. Nukers promoting contaminated food – the falsehoods of the Potassium excuse http://nuclearhistory.wordpress.com/2012/08/30/nukers-promoting-contaminated-food-the-falsehoods-of-the-potassium-excuse/http://nuclearhistory.wordpress.com/2012/08/30/nukers-promoting-contaminated-food-the-falsehoods-of-the-potassium-excuse/ I have blogged about this before. Attempts at selling contaminated food in the market of people’s lives by nuclear advocates has to stop in Japan and everywhere. It will take me the weekend to finish this post as I gather the historic and current sources which show the Potassium equivalent dose (which the industry calls the banana equivalent dose) is a false, incorrect, wrong and deceptive fallacy. In brief: radio potassium (K40) is much a very small proportion of all potassium. It is far less radioactive per unit weight (amount, physical dose) than any biologically active fission product. Potassium in any form is dangerous to the heart in excess, but potassium is a needed nutrient. “….MOX fuel poses a grave safety threat. Dr. Edwin Lyman, NCI Scientific Director, conducted a MOX fuel safety study using the same computer codes employed by DOE and the Nuclear Regulatory Commission. Dr. Lymans study concluded that, in the event of a severe accident resulting in a large radioactive release, an average of 25% more people would die of cancer if the reactor were using a partial core of plutonium-MOX fuel, as opposed to a full core of conventional uranium fuel. DOE itself has concurred with many of Dr. Lymans findings. Dr. Lyman also found that the impact of MOX fuel on certain reactor characteristics might also increase the chance that such a severe accident would occur. DOE and Duke dismiss such accidents as extremely improbable—but it must be remembered that the accidents that took place at Three Mile Island, Chernobyl, and the Tokai nuclear-fuel plant in Japan last September all had been similarly dismissed as highly unlikely or even impossible events. Don’t believe the spin on thorium being a ‘greener’ nuclear option Ecologist, Eifion Rees 23rd June, 2011 It produces less radioactive waste and more power than uranium but the UK would be making a mistake in looking to it as a ’greener’ fuel. The Ecologist reports….. nuclear radiologist Peter Karamoskos, of the International Campaign to Abolish Nuclear Weapons (ICAN), says the world shouldn’t hold its breath. Realistically the world might build 100 or so new reactors over the coming decade or so – .. Over this same period a similar number of existing reactors will reach the end of their lives and close, leading to a net growth rate close to zero. 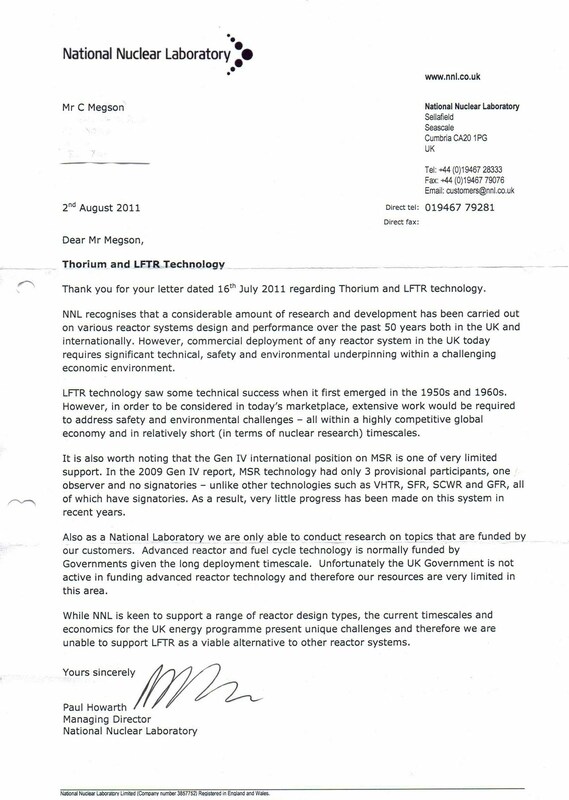 A pro-nuclear engineer let slip to me a while ago the real attiude of the nuke industry to Thorium. They see it as hedging their bets in case fusion proves to be harder than they thought and they don’t get commercial grade fusion plants up and running by the 2050′s. If that occurs, then that’s when Thorium (or LFTR’s) will figure. In other words, to them its a blue sky idea to sort out a future energy crisis, not the one facing us right now. This is why you see a vast gulf of a difference between pro-Thorium bloggers and the nuclear industry establishment. Medical Radiation Soars, With Risks Often Overlooked NYT, By JANE E. BRODY AUGUST 20, 2012, Radiation, like alcohol, is a double-edged sword. It has indisputable medical advantages: Radiation can reveal hidden problems, from broken bones and lung lesions to heart defects and tumors. And it can be used to treat and sometimes cure certain cancers.